The other day on Facebook, I asked you what some of the recipes are that you've always wanted to make, but didn't know how. Surprisingly enough, Homemade Ratatouille was a request that I got several times. To begin you will need to prep all of your vegetables. This is literally the most difficult part of this process. Secondly, you will need to place a heavy soup pot over a medium/high heat and add some oil. Once the pot it hot, add the eggplant and zucchini. Let the eggplant and zucchini brown, stirring occasionally, for 3-4 minutes. Next, add a little more oil then, the peppers and onions. To the peppers and onions add the garlic, herbs de Provence (or thyme), and chopped basil stems. Cook for 3-4 minutes until soft and translucent. When the peppers and onions are soft and translucent, return the eggplant and zucchini to the pan. The roma tomatoes are going to give this vegetable stew great flavor, but they will cook away. The canned tomatoes will hold their integrity during the cooking process. And finally, I add a little sugar (1 Tbsp) to help with the acidity of the tomatoes. Again, this step is not necessary. It is at this point that, if you choose to do so, you can put everything in your crockpot and cook on LOW for 5-6 hours. I personally am not a fan of the final product when cooked this way, but you can do it. Cover your pot and simmer for 30 minutes, stirring occasionally. You will notice that I didn't add any liquid to this stew. That is because there is SO MUCH water in these vegetables, as they cook down they create a broth all their own. After 30 minutes give everything a stir and taste for seasoning. Tear your basil in to bits-sized pieces. Add to the Homemade Ratatouille. And there you have it! 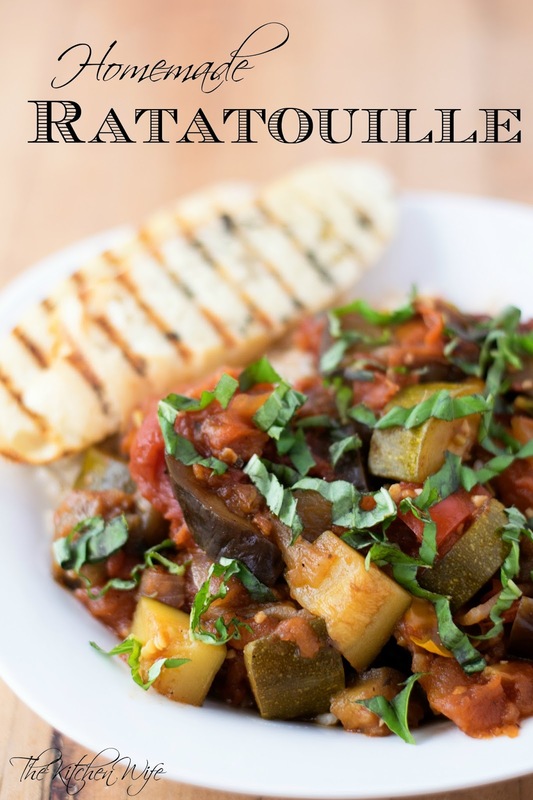 Your Homemade Ratatouille Recipe is complete! This is truly one of the most delicious vegetable stews you will ever eat in your life! You can eat it plain or serve it over pasta, mashed potatoes, or rice as I have done here. Pair it with some nice crusty bread and you are ready to eat! I know you are going to love this recipe so get in the kitchen and give it a try TONIGHT! Place a soup pot over medium/high heat and add some olive oil. 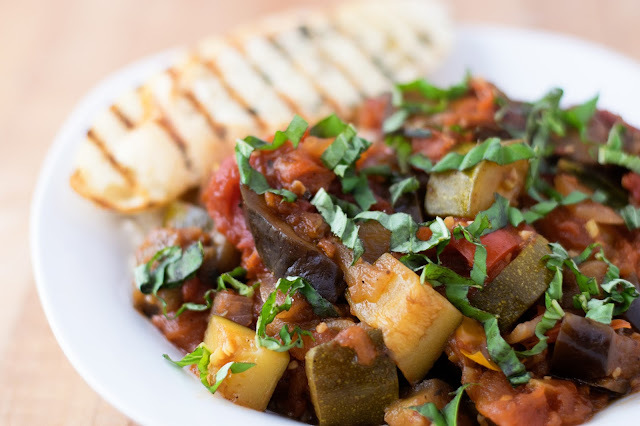 When the pot is hot, add the eggplant and zucchini. Season with a little salt and pepper. Cook until tender and slightly browned, about 3-4 minutes. Remove from the pot. Return the eggplant and zucchini to the pot. Add the roma tomatoes and canned tomatoes. Add the balsamic vinegar and sugar. Give everything a stir. Add the fresh basil to the pot and stir. Eat as is, or serve over pasta, mashed potatoes, or rice. *AT THIS POINT YOU CAN ADD EVERYTHING TO YOUR SLOW COOKER AND COOK ON LOW FOR 5-6 HOURS.